The slideshow above shows photos of Mayor Testa's trip to Castlebar, Ireland. Mayor Testa, family and delegation attended a Town Council meeting and presented a proclamation from the City of Peekskill reaffirming the "twinning" between the two cities and pledging continued progress on a cultural exchange. The delegation was also given a tour of the Castlebar library. The Castlebar Town Council also hosted a welcome dinner for Mayor Testa and the delegation accompanying him. The next day, Mayor Henaghan and Town Clerk Marie Crowley hosted the delegation on a trip to the famous Ashford Castle. Also included in the slideshow is a small sampling of the many photos taken on the trip showing the beautiful and historic countryside of Ireland. In 2000 the City of Peekskill and the Town of Castlebar, County Mayo, Ireland established a “twinning or “sister” relationship. The idea of such an action was developed and suggested by members of the Peekskill St. Patrick’s Committee. Since 1989 The St. Patrick’s Committee has been a community organization committed to promoting the Irish Culture and the contributions that residents of Irish heritage, both past and present, have made to the Peekskill Community and surrounding region. Each year, the St. Patrick’s Committee organizes a series of events leading up to, and including, the Annual St. Patrick’s Parade. 2009 marks the 20th Anniversary of the parade and the great work done by the committee to establish a true tradition in Peekskill. The relationship between Castlebar and Peekskill has become an increasingly important component to the tradition established by the St. Patrick’s Committee. As Mayor (and someone with a maternal Irish heritage), John Testa looked to reaffirm that relationship and became very involved with the annual events along with establishing deeper connections to Castlebar and the Castlebar Officials who annually participate in the Peekskill events. 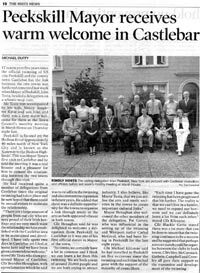 In the summer of 2006 Mayor Testa, his family and two members of the Peekskill St. Patrick’s Committee (Patrick Garvey and Cathal McGreal) traveled to Castlebar to solidify and expand the twinning relationship. It was the first such visit from a Peekskill official to Castlebar. Up until that time only Castlebar officials had made visits to Peekskill. As can be seen in the photos above, the trip was an overwhelming success. Not only was the relationship between the two cities strengthened, but also new initiatives were developed to bring an even more cultural exchange between them. Most importantly, an artist exchange program was agreed upon and the hope was to have artists from each city spend time in the “sister city.” When Mayor Testa discovered that Castlebar possessed a significant artist community and Art Centre he felt it only natural that an artist exchange program would be beneficial. The Mayor of Castlebar Brendan Henaghan agreed, as did the members of the Castlebar Town Council.